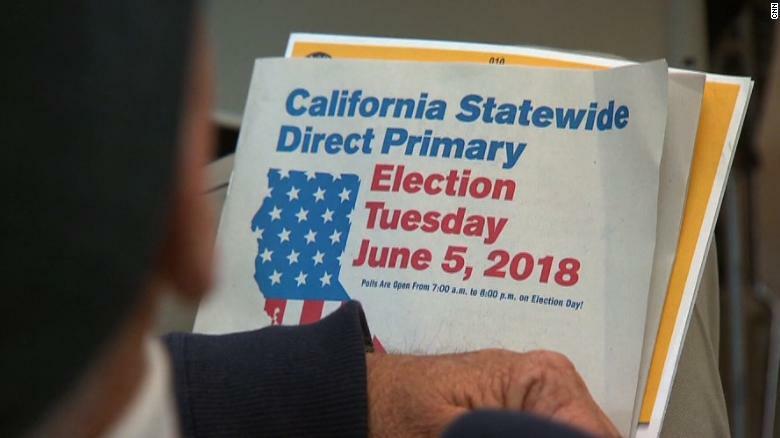 California Democrats have been denied their supermajority in the state Senate. Democrats temporarily lost their supermajority in February when a lawmaker accused of sexual misconduct resigned. They likely would have gotten it back in a special election in August. But then they lost another seat on Tuesday, when voters in an Orange County district recalled Democratic Sen. Josh Newman from office over his vote to raise gas taxes last year. Former Republican Assemblywoman Ling Ling Chang won the seat, meaning Senate Democrats won’t hold the two-thirds majority needed to pass tax and fee increases. Republican John Cox has secured a spot on the ballot to face Democratic Lt. Gov. Gavin Newsom in the California gubernatorial election in November, boosted by a late endorsement from President Trump and voter discontent over liberal state policies. Fox News projects that Cox will advance to the general election in the race for governor, outpacing a former Democratic mayor for the No. 2 spot on the ballot. The state’s jungle primary system allows the top two finishers to advance regardless of party. Fox News also projects that Sen. Dianne Feinstein will place first in the state’s jungle primary — a widely expected result. She will likely face ultra-progressive State Sen. Kevin de Leon in November, who delivered remarks early Wednesday strongly suggesting that he will be the runner-up. There were some results in from the House races early Wednesday. Republican Rep. Mimi Walters easily advanced to the November election in her Orange County district that has been targeted by Democrats. The second spot remained up for grabs. And to the north, House intelligence committee chairman Devin Nunes, a Republican, qualified for the general election ballot as well. This entry was posted in 2018 Election, Government, News. Bookmark the permalink. Results look pretty good for us so far. Way too many D winners. Xavier becerra won. Most D won. Not all but too many. Lt guv, treasurer, ag, all dems. Run offs better produce the votes for Rs. Well, the big blue wave didn’t turn out quite like Democrats thought it would. The press is reporting they avoided panic, given that most of their candidates secured spots on the top-two on the November midterm ballot. Whoop dee doo. That’s not a blue wave, and it’s certainly not victory. Instead, what we really saw were signs of Republican strength in a state written off as solid blue, with bigger-than-expected margins for the GOP that all the Trump-haters out there in the establishment could forecast. We also saw a significant rejection of Democratic Party organizational favorites, which is a sign voters are tired of their lockstep voting practices. A third thing we notice is that heavy television spenders, such as Paul Kerr and Sarah Jacobs, didn’t make it. This, remember, was what Hillary Clinton did, instead of go to Wisconsin. It still fails. With contested races, we can expect a lot more ads flooding our airwaves as the November midterms approach. We can also expect Democrats to fight hard, given that California is the linchpin of their master plan to retake Washington. But there are more bright spots on the Republican side than the Democratic. For one thing, they have opposition, something they never expected. California, remember, is supposed to be the solidest of all blue states. Yeah, sure. And two, President Trump is popular. This election shows that he has coattails, and voters aren’t ready to give up on the Trump experiment, which is actually going so well. Three, and this is a goody, with Republicans on the ballot, it means Democrats will have to fight an issues campaign. Advantage, Republicans. It means that Democrats in both state and federal races are going to be pinned down and forced to answer questions they don’t want to answer about illegals, the gas tax (very potent), Obamacare, the GOP tax cut, green excesses, the high cost of housing, the bums ruining the quality of life in cities, and the bullet train. Once Democrats reveal their true positions, they aren’t going to find themselves at an advantage. It certainly isn’t going to help the large numbers of moderate-type Democrats who were in some of the top-two spots in the downwind races (they will squirm), and it really won’t help the Bernie Sanders-style leftists in similar spots, who will be completely open about their positions. Insane California voters want to leave but keep voting for more of the same.